The winners of the Terry Pratchett - Anywhere but here, Anywhen but now award - Half Sick of Shadows by Michael Logan and Apocalypse Cow by David Logan have been publish by Transworld Publishing. David Logan's anomalous world, the world of the Manse, is an unsettling place to be, precisely because he springs that shock on his unsuspecting characters - an uncommon trick, which requires the audacity not just to make a new world from scratch, but to unmake it too. After all, getting a second opinion on the rules of reality can be a dangerous thing - as you'll know if you are familiar with the poem from which Half-Sick of Shadows takes its name. Once you start to question the laws and promises that hold your world together, the whole thing can start to come apart. So step inside the world of the Manse, and watch it unravel around you. I was looking for books set at any time, in any place. 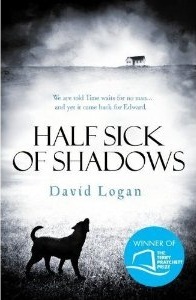 I hadn't considered the possibility of a world in which cows became ruthless, libidinous killers, but it is a tribute to Michael Logan's imaginative powers that he was able to do so, and serendipitously, to come up with one of the best bovine puns in literary - or should that be cinematic? - history. The key to creating an alternative world is that it has to be believable - on another variant of Earth, there might be some unusual goings-on, but you still recognize that it is Earth. 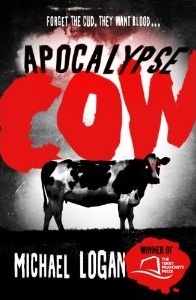 Apocalypse Cow has stayed true to that - the world it portrays is so slightly removed from our own that it could almost be teetering on the crotch of time, threatening at any moment to change its mind and tip down our own trouser leg. Think about that the next time you tuck into a steak.